Nigeria police on Monday evening finally announce say dem arrest di members of di Anti Cultism unit of Nigeria police force wey kee one Kolade Johnson for Mangoro bus stop, Lagos run on Sunday. Inside statement wey Lagos State police command release, police say na "eyewitness helep dem sabi di team wey run immediately " dem shoot Kolade. "Members of di team wey dem suspect say dem get hand for di shooting don dey under arrest and now dem dey police custody dey do interrogation." According to di Lagos Police Public Relations Officer DSP Bala Elkana. Meanwhile, di Lagos State commissioner of police Zubairu Muazu say make Lagosians cool temper, say Kolade go get justice. Image example SARS na special anti-robbery squad of Nigeria Police and for 2018 dem enta news wella because of how dem dey take do tins. Some Nigerians enta street protest and even create di #EndSARS campaign, unto how dem say di police unit dey take treat especially young pipo. 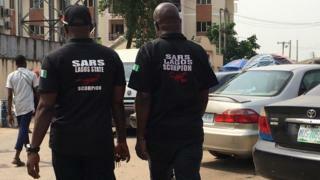 Rights group, Amnesty International on Monday tell Nigeria goment say make dem investigate di death of one innocent Nigerian wey Special Anti-Robbery Squad (SARS) police unit kill for Lagos on Sunday. Police bin kill one young man through accidental discharge as dem dey pursue anoda man for viewing centre. Director of Amnesty Osai Ojigho say, "Kolade Johnson na di latest victim SARS police unit wey don dey notorious for illegal kee kee, torture plus to collect moni and oda tins by force." Ojigho say, "e dey shameful say more dan two years wey Amnesty international show di crime wey SARS don commit under international law and human rights, dis kain shocking tins still dey happun." Tori be say stray bullet hit one pesin wen di officers dey try pursue pipo wey gada as dem dey try to arrest anoda man for Mangoro area of Lagos. Many Nigerians dey para about im death especially on top social media.